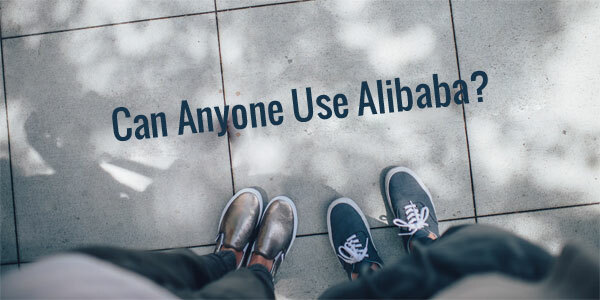 If you are looking to import Alibaba wholesale products from Asia, then this post will teach you how to use Alibaba the right way so you don’t get ripped off. With that in mind, Alibaba is one of the largest databases of Asian suppliers in the world. And it is by far one of the best places to find China wholesale vendors online. But because Alibaba is so large, it is also filled with unscrupulous suppliers who will sell you junk or try to cut corners on quality. This guide will teach you the right way to use Alibaba and avoid the headaches. 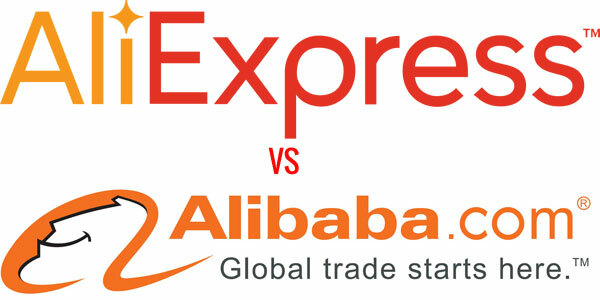 Alibaba Vs AliExpress – What Should I Use? Can Anyone Use Alibaba And Do You Need To Own A Company? Is Alibaba Safe And Will You Get Ripped Off? Alibaba is a directory of Chinese suppliers where you can find factories to manufacture products for you at wholesale prices. Almost every supplier that you find on Alibaba will allow you to place your own brand on your product which is a practice known as private labeling. Because many suppliers on Alibaba are manufacturers or factories, they will usually force you to purchase a minimum order quantity with every order and you have to buy in bulk. 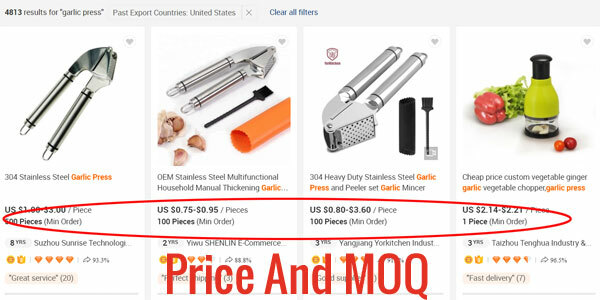 Now the MOQ (minimum order quantity) will vary from supplier to supplier, but in general, you should be able to find a supplier on Alibaba that matches the size of your business. For example, when my wife and I first started our handkerchief store, we found vendors willing to sell us as few as a hundred units per order. But now that our ecommerce business is much larger, we primarily work with vendors with minimum order quantities in the 10’s of thousands of units to obtain much lower pricing. If this is your first time using Alibaba and you are having problems finding the right supplier, don’t get discouraged. After all, there exists an Alibaba wholesale vendor for every business size. You just need to know where to look. Both Alibaba and AliExpress are owned by the same parent company (Alibaba Holdings Group) so it’s very easy to get the 2 platforms mixed up. But AliExpress and Alibaba are different companies with completely different use cases. Whereas Alibaba is a Chinese wholesale directory of factories and trading companies, AliExpress is more like a Chinese version of Ebay. 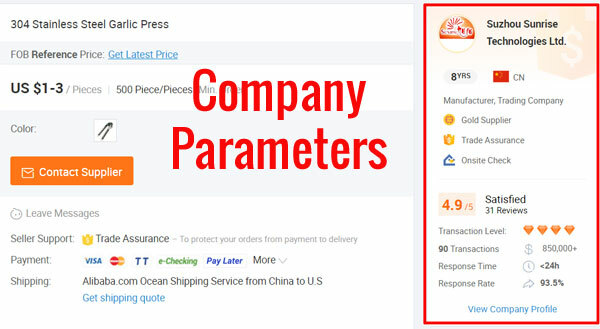 In fact on AliExpress, you can buy products in single unit quantities and factories often use AliExpress as a liquidation outlet for their products. As a result, the prices on AliExpress will be much higher than Alibaba and in general, AliExpress is not a good platform to find long term suppliers for your ecommerce business. Also, vendors on AliExpress will not allow you to customize their products (or attach your brand) so you can not private label products you find on AliExpress. Bottom line, Alibaba is the platform that you want to use to find wholesale suppliers for your ecommerce business. You don’t need to have a company or any special credentials to use Alibaba. You don’t need a sellers permit, a website, a corporation….nada. In fact, most Alibaba wholesale suppliers don’t care who they are working with as long you buy in bulk, pay on time and order on a consistent basis. Remember, Alibaba is just an online directory for Chinese suppliers and it’s up to you to negotiate price and minimum order quantities. Some of you have asked me in the past whether you need to have a custom business domain like steve@mystore.com before contacting suppliers on Alibaba. And while it certainly helps for credibility, I’ve had students in my class use their gmail addresses and it’s worked out just fine. I’ve been using Alibaba for over a decade now and I’ve never been outright scammed. As long as you follow the directions in this post, the chances of a Chinese supplier taking your money without sending you your products is extremely slim. More likely than not however, you’ll run into quality control issues. In fact, your primary concern when buying from Alibaba wholesale suppliers is that you’ll receive poor quality products that don’t match what you expect. 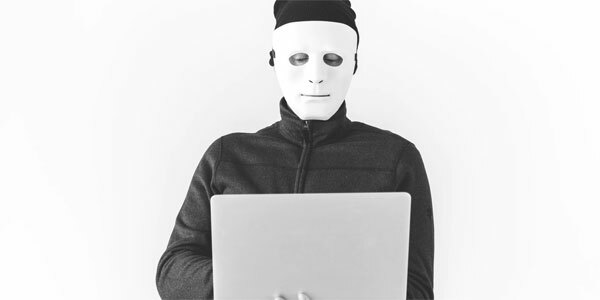 To prevent this from happening, you MUST follow the guidelines and best practices in this article when finding and ordering from Alibaba suppliers. 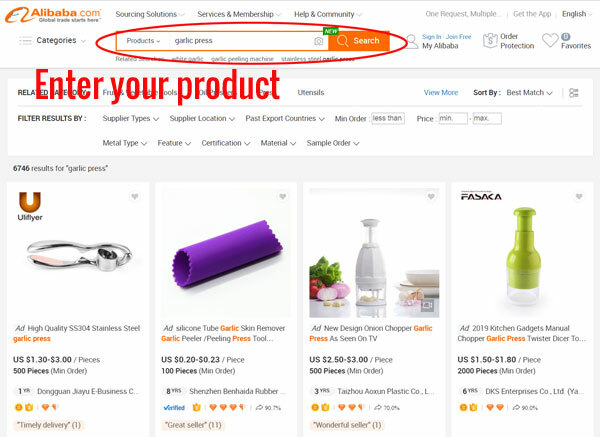 Once you know which product you want to sell online, you should start by performing a search using Alibaba’s search bar. By default, Alibaba will display every single supplier in its database that sells the product you want to source. But many of these listings will be middlemen or individuals trying to make a quick buck and not real companies. 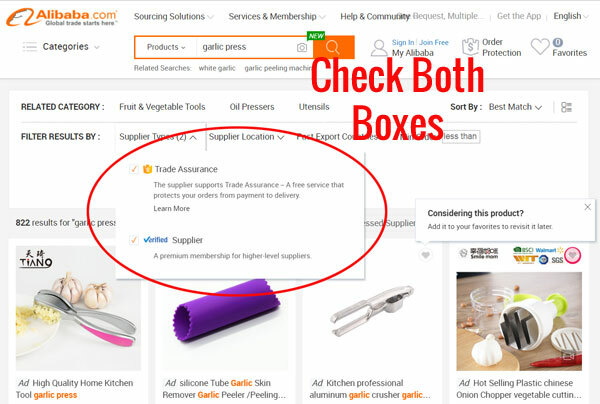 As a result, the first action you should take is to filter out only verified suppliers (Gold suppliers) and vendors that support trade assurance. What Is A Verified Or Gold Supplier? A verified or gold supplier is a vendor that has paid Alibaba a premium membership fee and you can use this badge to weed out lower tier suppliers. Onsite Check – An onsite check is a verification process where the supplier’s factory is checked by Alibaba’s staff to make sure that it’s legit. 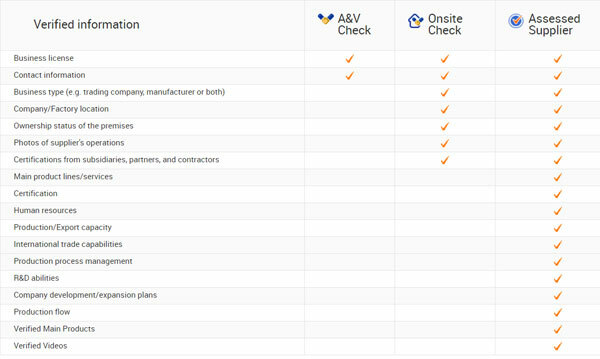 In addition, the supplier’s legal status is also checked to make sure it’s up to date. There is also an additional company tier called an “assessed supplier” where a mainstream verification company like Bureau Veritas goes through and assesses the supplier for their production capabilities, their certifications, and their R&D abilities. An assessed supplier is the highest grade supplier that can be found on Alibaba. I’ve attached a table for your review. Bottom line, working with only verified (gold) suppliers will greatly mitigate any risk of getting scammed. Trade assurance is a free order protection service where Alibaba acts as a 3rd party escrow company. The supplier prepares the goods for shipment and you deposit your payment in a special account designated by Alibaba. As soon as the order is confirmed, the goods and the money changes hands. What’s nice about trade assurance is that Alibaba guarantees your money back in the event of a supplier failing to meet the terms of the order contract. This includes delays in shipment, quality issues and processing problems. Bottom line, trade assurance all but ensures that you will not get outright scammed by your vendor. Once you’ve filtered out the gold and trade assurance suppliers, you should pay specific attention to the price and minimum order quantities. In practice, the numbers you see on Alibaba are never set in stone and you can always negotiate more favorable terms. However, the numbers will give you a general idea of the type of customer the supplier is looking to work with. For example if you’re just starting out, you’re probably not going to be working with a vendor that has a 20,000 unit minimum order quantity. Instead, narrow down the list of vendors to those who closely match your purchasing power. Once you’ve selected a bunch of vendors that you potentially want to work with, you should dig a little deeper and review their company profile. Payment Methods – Most vendors are used to being paid by wire transfer. But if this is your first time importing, you might want to look for vendors that accept Paypal and credit cards. Response Rate – Is the supplier responsive to inquiries? 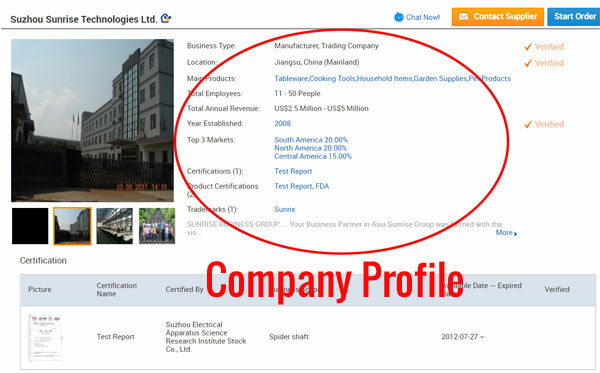 You can also click on the company’s profile page to get more in depth information such as company size and annual revenue as well. As you can see, the information that can found on Alibaba is very thorough. 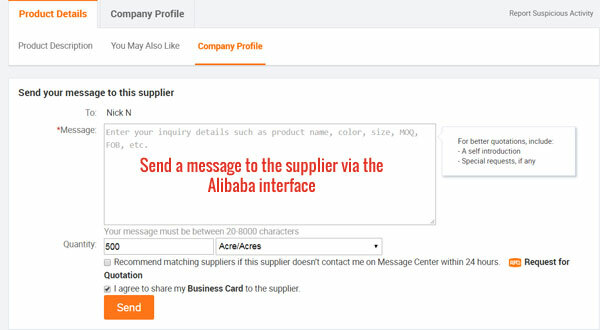 There is a right way and a wrong way to contact Alibaba wholesale suppliers and it’s a lot like dating. The reality is that most suppliers on Alibaba are flooded with hundreds of inquiries per day. As a result, your correspondence must stand out among the pack and you must be concise and professional. Pretend that you are the supplier for a moment. Would you want to waste time speaking with a customer who doesn’t know what they want. Would you want to work with a total newbie? As a result, you must project confidence and act larger than you really are. You should present yourself as a buyer or a director of a larger retail organization. Here’s a sample script that I use when first reaching out to a supplier. My name is Steve and I’m a buyer for Bumblebee Linens, a store in the US that specializes in handkerchiefs. We are interested in carrying many of the items that you have to offer. When you are importing from China for the very first time, you probably have no idea what the “real” price of your products should be. As a result, you should shotgun blast as many vendors as you can and obtain as many different quotes as possible. Ultimately, the quotes that you’ll receive will fall under a bell curve distribution. Some quotes will come back impossibly low. Some quotes will come back really high. But most quotes will fall within the same range. In general, you should eliminate all factories with abnormally low bids because those suppliers likely sell low quality goods. Personally, I like to stick with the suppliers that offer mainstream pricing. If I’m looking to produce a high end luxury product, then I might work with a more expensive factory but you have to go with your gut. Bottom line, I generally do not negotiate on price until I’ve obtained samples of the product and until I know which factory I want to work with. At this point, you’ve hopefully narrowed down your list of vendors to 2 or 3. It’s time to ask for samples! Before you place a bulk order with any manufacturer, you must touch and inspect a finished version of your product for quality. First off, the cost of your sample will be significantly higher than your quoted cost for a bulk order. And by significant, I mean a sample will often be 10-20X more expensive. For example, we recently asked for a sample of a white linen napkin and it cost us $50 whereas our bulk price is typically $2 per piece. Do not balk at the sample price and do not try to negotiate! In reality, your supplier will credit the cost of the sample towards your first bulk order but paying for samples is just a necessary expense of doing business in China. Specific shade of white – There are hundreds of shades of white so we have to be specific. How it should be pressed – If we don’t specify the presentation of our linens, the vendor will just throw it in a bag all wrinkled. Now there are many more line items on our quality control checklist, but hopefully you get the point. Once you are happy with your sample, it’s time to place a bulk order. If this is your first time importing from China, I highly recommend that you get your first order shipped by air courier. Not only will you not have to hire a customs agent, but your goods will arrive on your doorstep within a week or less and you don’t have to worry about anything. Often times, you can simply ask your supplier to ship the goods directly to you using their DHL or EMS account. But once you have your first few successful shipments under your belt, you will eventually want to have your goods shipped over by sea which is substantially cheaper. 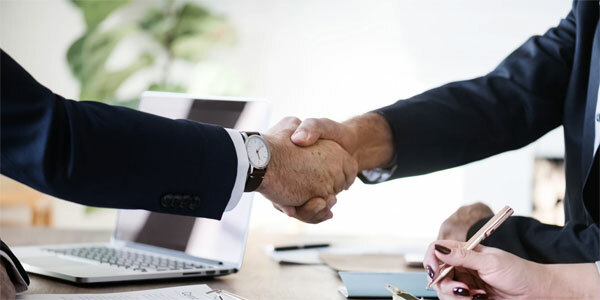 While the exact procedure for shipping by sea is beyond the scope of this post, you should definitely hire a reputable freight forwarder and customs agent to handle everything for you. But beyond getting your goods to your warehouse, the most important factor to consider when placing any bulk order is quality control. Before your goods ever leave a Chinese factory, you must hire an inspector! A company like Asia Inspection (now called QIMA) will send a representative to your factory and examine a subset of your goods based on your quality control checklist. The cost of this service is roughly $300 and the expense is well worth the cost. Once your goods pass the inspection test, you are finally ready to start selling! Even though the instructions in this tutorial are fairly straightforward, you will always encounter some hiccups during the process. 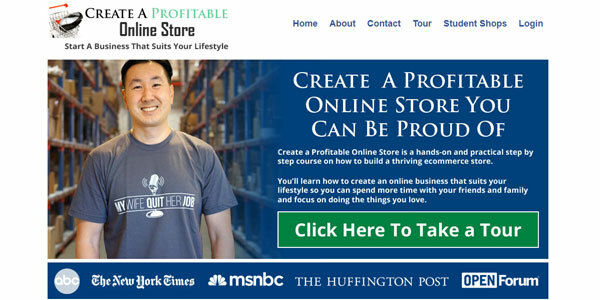 As a result, I invited a student in my Create A Profitable Online Store Course, Josh, to provide a candid and realistic account of his first experience importing from China. Now in my class, I have an entire module dedicated specifically towards helping students import goods from overseas that goes way beyond this post. However, it’s one thing to learn and another thing to actually go out and do it. And Josh’s experiences just go to show that the best way to learn is to be aware of the guidelines, know what to expect and just take action! A quick disclaimer: Josh had never done this before prior to joining my class and he was a bit intimidated early on by the process. But after going through it once, he realized that it wasn’t that bad. The rest of this post is written from Josh’s perspective! As Steve mentioned above, I recently completed the sample sourcing process and wanted to share some tips and mistakes I made along the way. Enjoy and please let me know if you have any questions or comments. When it comes to communicating with your vendors, you should never make any assumptions about product availability. On multiple occasions I had vendors try to sell me products that were not displayed on their website. In contrast, I also requested samples of products that were displayed online but no longer available from the vendor. Often times, a vendor’s website is not up to date and some vendors are better than others at maintaining their online offerings. I even had one instance where after paying for samples the vendor came back and informed me that 6 of the 9 samples ordered had been discontinued. Moral of the story – Don’t assume something is or isn’t available. Make sure to ask and confirm prior to ordering and especially paying for any samples. Are there any new products or designs that are not currently displayed online? Are there any products displayed online that were discontinued or no longer available? Most vendors that I dealt with responded in a quick and friendly manner, which reinforced the importance of relationship building. While in a few instances vendors seemed a little cold, most vendors were very eager to engage in conversation, answer questions and discuss samples. Moral of the story – Vendors are real people just like you and me. Don’t be afraid to jump in and start a conversation. Tip: All the talk these days is about Alibaba, but I actually had better luck with Global Sources. Make sure to give both websites a shot. Some vendors are almost too friendly. This is probably due to the cultural differences that exist but when I say too friendly I mean 2-3 emails a day, asking if you want to look at or buy something after you’ve explicitly declined or said no 3-4 times. Editor’s note: I never use my main email address for Alibaba correspondence to avoid getting spammed by vendors. Moral of the story – Trust your instincts. Give people the benefit of the doubt but go with your gut. Tip: If you’re trying to source leather bags and the vendor is trying for the 4th time in 5 days to sell you cat beds, time to hit the spam button. Tailor your vendor inquiries for specific product categories. This might sound obvious but it’s important to be very specific from the start about what you are looking to buy including types of products, materials, size, color, etc. As an example, I was searching for a variety of bags including leather bags. When I sent an initial email to one vendor who specialized in leather, I accidentally included photos of non-leather bags which caused some confusion. I would also advise using an email template (I used the one provided in Steve’s course) but make sure to customize 10% of it to each vendor. If you want something made of polyester, specifically state in your email that you are looking for a polyester widget. Otherwise, like me you might receive a different and most likely cheaper product or material than you intended. Moral of the story – Don’t assume anything regarding product details. Tip: Be very specific and ask the vendor to confirm product specifications before both production and shipping. The ole saying, “ what you see is what you get” doesn’t necessarily hold true for Alibaba and Global Sources. Despite doing everything suggested above, there were a couple occasions where the samples I received were not the samples I ordered. Moral of the story – You never get a second chance to make a first impression. Don’t be afraid to hold a vendor accountable. Some might disagree on this one but my thoughts are if they can’t get a simple sample order correct, the likelihood of screwing up a bulk order is probably be higher. Tip: Confirm the sample order prior to shipment and request photos of the samples to ensure they are accurate. Payments! Most vendors will allow you to pay via PayPal. Some have PayPal but will not tell you unless you ask so make sure to ask. In fact, with most vendors, I used wording along the lines of: “Our company policy states that first time samples purchases be made using PayPal”. While most vendors will accept purchases through PayPal, they definitely prefer and will default to T/T (wire transfer) or Western Union. I paid via Western Union for one vendor and didn’t have any problems. I found it to be just as easy as PayPal but with Western Union you have no recourse to get your money back. Once the money is gone, it’s gone. Moral of the story – Pay for most samples using PayPal but don’t be afraid to pay via wire transfer or Western Union. It’s not the end of the world. Tip: I would recommend paying via wire transfer (T/T) with one vendor just for the practice. If it makes you feel better, choose a vendor who you will be paying a smaller amount of money to for samples. Although just a suggestion, doing this will help to familiarize you with all the routing and logistics related to international wire transfers. If you decide to pay via wire transfer, make sure and confirm that you have the exact wire information including beneficiary information, address, swift code and account number. This point can’t be emphasized enough. I learned the hard way with one vendor and it cost me $75 in wire fees. If one character is incorrect, then the Bank of China might relegate your funds to the Chinese banking void for an unspecified period of time. Plus, you’ll have to pay additional fees to your bank to either recall or amend the wire. Samples are an investment. Pharmaceutical companies are notorious for spending millions of dollars on R&D every year. Most drugs will not make it through clinical trials and some will not receive FDA approval, but the few that do make it past all the hurdles will make the investment worth it. While purchasing samples can seem daunting, make sure to keep things in perspective. Compared to an initial investment for a Subway or UPS Store franchise, the risk/reward ratio is much higher for online stores, not to mention the difference in lifestyle. Moral of the story – Don’t be afraid to spend money on samples. You have to know what you’re selling before you can sell it and you’ll learn a lot in the process. Be judicious depending on your budget, but don’t hold back for fear of failure. Tip: Ask vendors what their top 5 products are in terms of sales. Take your time to find the products you like the most because more than likely there will be more products you’ll want to see in person than you’re willing to pay for. Pick the very best ones based on the photos, product descriptions and vendor recommendations. In your emails to vendors, use the word “we” instead of “I” and “our” instead of “my”. Steve emphasizes this several times in his course. Not only does this make your company seem larger than it is but it also displays a sense of teamwork and unity. Moral of the story – Project confidence. Tip: Here is an actual email I sent to a vendor after receiving samples. Notice the use of the word “we” and “our”. We wanted to confirm that we received the samples today. Over the next couple of months we are going to be meeting with many of our customers to discuss your products and potential plans to move forward with larger purchases. We will certainly keep you updated on our plans. 1) Do you provide OEM service (logo)? 3) What are the minimum order quantities and lead times for bulk orders? 4) How do you deal with product quality issues? For product YD0354, the zippers were very difficult to fasten and ended up breaking in one instance. For most products, we prefer one piece (like YD0316) instead of two pieces to make the assembly process as easy as possible for our customers. Which vendors did you enjoy working with the most? Which vendors were the most flexible and accommodating? Which vendors wrote and/or spoke the best English? Which vendors shipped the samples in a timely fashion? Which vendors shipped samples that were packaged nicely? Which vendors were the most accurate and paid the most attention to detail? In the end, your experience will be different than mine, but I hope that the tips above can help you along your journey. Excellent set of tips Josh! They are truly useful and I will most certainly keep them in mind as I start my own Journey down this road soon importing products into the Middle East. These are excellent tips. i especially like questions to ask after you receive samples. 1- do you really need to use leadpages for the landing page? Any wordpress theme could do what I see on your landing page. @Taher and Sophia – Thanks glad you enjoyed! @Viv – I imagine you could definitely use WordPress for a landing page, especially if you already had a blog or ecommerce site already setup. Since I didn’t have my shopping cart setup yet, LeadPages was the most convenient option for a couple of reasons: 1) they have some really nice templates designed for specific goals (launch, webinar, etc) and 2) they don’t require any coding (disclaimer – I think understanding basic front-end code is a good thing!). But for the purposes of getting something up and running as quickly as possible to capture leads or for those who don’t want to deal with hosting, LeadPages or any SAAS landing page site for that matter might be a good alternative. As to your second question, this is something I have thought about a lot recently. When taking into account all the ancillary costs you mentioned and then some, the rock bottom $7 price per unit you thought you were getting is actually more like $11/unit which obviously affects your margins. I think it depends on your industry and what products you sell. To my surprise, I discovered that the vast majority of companies (including fortune 500 retailers and wholesalers) in the U.S. that sell pet supplies are sourcing their products from China. So I suppose one would need to weigh the incremental cost of importing vs the cost of finding a contract manufacturer and getting things setup here in the US. Thanks! If the supplier will setup the shipping costs for the samples, then what is the need of me having an shipping account? 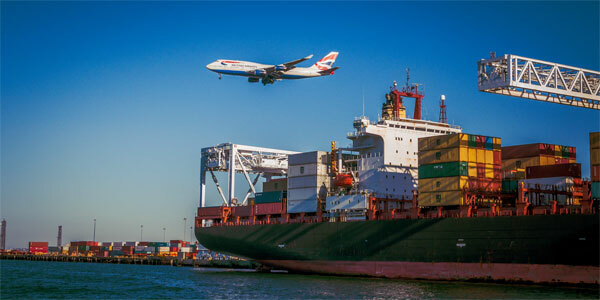 We can always track the shipments on their websites for free. And Josh, which country do you belong to and how is your Amazon Business Doing? @ Novneet – thanks for your comment. I live in the United States. Regarding shipping, I think it’s important to have at least 1-2 shipping accounts setup beforehand because some vendors might not only ask but require you to supply them with a shipping account number that they can use to bill the cost of shipping you the samples via air freight. In essence, you will pay the vendor directly for the samples (using PayPal or wire transfer) but not the cost of shipping. In my experience this is the exception and not the rule. I’m not sure why some vendors do it this way but it happened to me twice. Hope this answers your question. I sold all of my samples on Amazon within 40 days which was good. Now I’m working on building those supplier relationships and setting up my store. Yes Thanks for the clarification man. I am in the beginning phase of setting up my Amazon Business. The product niche research and the finding the suppliers. It is really a scary thing for me, as I have never has done any sort of importing previously. Will it be possible for you to provide your email, if it is not much trouble, so that I can ask any import related questions directly? Its a fact that every year the wholesale products are imported to various regions or countries. 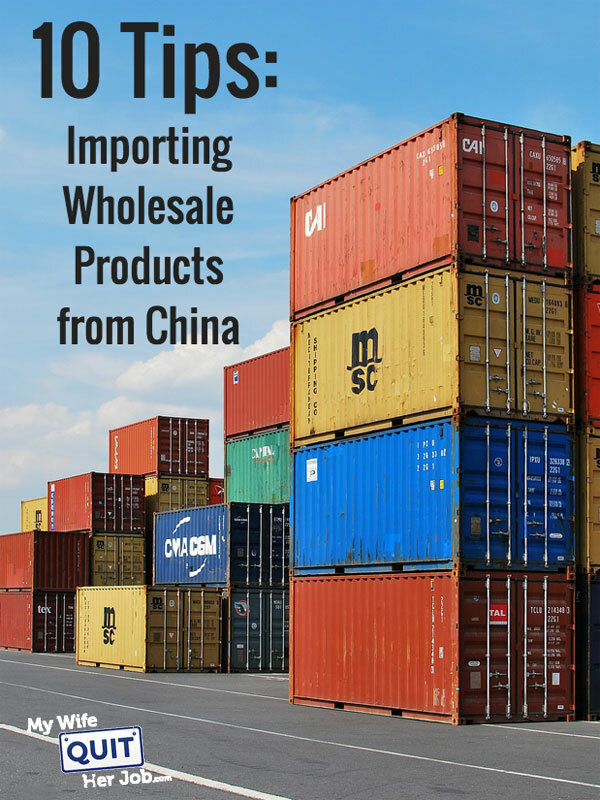 This particular post emphasize on the relative Tips On Importing Wholesale Products From China Using Alibaba Or Global Sources. I think this is way beneficial post than that of it appear. One must go through the same. Thank you for this amazing post! I am wondering about the taxes once the products get to my country!? How should I deal with that? Would apreciate ur help! Josh – thanks for the great article. I have contacted and received samples from four different companies, for two types of items I hope to sell. Your comments about learning the difference between a manufacturer and a wholesaler is right on target. On my first try on the first product, I ended up ordering samples from a mfr. & wholesaler, not realizing one of them was in fact a wholesaler. And to top it off – they actually purchased their product from the mfr. that I ordered from! Certainly a lesson learned. And yes, it is a shock when the air shipping cost is so high. But overall, it is a learning experience and I actually hope to go to China in the future and meet some of these folks. Thank you Josh for the great article for us all. If you have any infomation on the taxes when the products arrived, please keep me posted. And how do you receive the products in such ways? 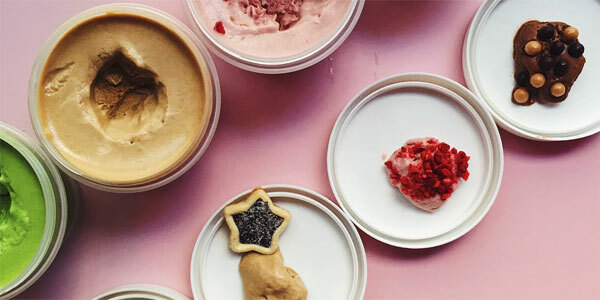 Since you have to pay for samples, how do you know the quality of the samples will be comparable to the items in your first order from the supplier? Do you have a way of returning the shipment at the suppliers expense if the quality is not up to your standards or do you just request a refund from Paypal? The answer is that you won’t know for sure. This is why I always gradually increase my order size over time. If you want to be extra careful, you can hire a 3rd party inspection company. Returns are highly unlikely. Not only does it cost too much money to ship back to Asia but a lot of vendors won’t take returns. I suppose you could file a chargeback but no guarantees that you’d win. Im really having hard time on what to import from.china and sell it here in the philippines, hope you have an idea. I am tiger from yiwu of China,I am doing international trading business to help foreigner friends import from China,any one who need help,don’t hesitate to contact with us. I am just starting the process of ordering goods in the Philippines. Still researching on what I should do. I am new to starting a business and ordering products overseas. I have family in the Philippines, would it be better for my family to purchase the products/samples and then send it to me here in the States, or should I let the supplier/manufacturer do that. Which would be more efficient and also what would save me money?? Thanks for this article. I’d like to share my limited experience if I may. I once purchased some sample watches and walkie-talkies; in hindsight it was probably from a wholesaler rather than manufacturer. Even then I believe some manufacturers use their own vendors to sell samples on their behalf. In both instances I insisted on PayPal and yes they did ask for 3-4% extra to cover the fees. I had them sent to me through FedEx. If you’re just starting out like me, believe me when I say they definitely have better rates than you in regards to courier charges so there was really no point in insisting that I pay through my account. On the watches, I receive only 2 out of the 3 samples I ordered. They weren’t expensive and I doubt that FedEx employees would scam me on those. But from the FedEx tracking, I realised that the vendor used a logistics company to send their products in HK to FedEx, and this is where the theft probably occured. There was no point pursuing any legal action over a cost so small so I just let it be. On the walkie talkies, I had to Ensure that they sent me with the correct voltage, and frequency marking on the package because otherwise it might be withheld in customs indefinitely. What I mean is that you have to watch out for any legal requirements on importing something into your country to prevent seizure or delay. On the PayPal payment, I realise that the account name actually belonged to an unknown individual. I didn’t really bother because it was a small amount but obviously you would want to check that the account name matches the company you are dealing. I think probably Alibaba escrow would be good. It is also good if the vendor can give you documentation such as ISO, export license with their name on it. They should be current. Good article and tips, thanks for sharing. Helpful information. Thanks for sharing this post. The tips are very good. It will help a lot. I have a question. If a product has a price marked at alibaba site of $3- $10.99 can the vendor charge you $20? What can you do to force him to give you the price that is marked on the site? I want start Business on amazon. I want to sell Cellphone Accessories related Products. hello, I’ve a question. if I order 144$ product from alibaba.com, then what can be the total cost including shipping charge and taxes in Bangladesh? can you tell the taxes process on per product broadly? I want start Business on amazon. I want to sell beauty related Products. Thanks for your this best idea. Nice article, thanks for sharing this Helpful information. Informative article for anyone who wants to learn more about this subject. Thanks for sharing this post. The tips are very helpful. What about large items, like gokarts, buggies, and offroad vehicles? I’m curious about customs issues and transport costs to my door. Any way I can estimate shipping costs for large containers without wasting my or a dealer’s time? I’d like to have an idea of my total cost for a “high dollar” item to see if it’s worth it to import dirwctly or pay the markup for a US based wholesaler. Great article indeed, lots of really good pieces of information. We actually decided against this in the end in favor of locally produced bedding, however worth keeping in mind. “Their ability to both send and receive emails exceeded my expectations.” Wow, patronising much? Impressive article, I can learn a lot of knowledge, I come from China, after reading this article, I want to do business with friends from all over the world, I have many excellent Chinese products, maybe we can brainstorm together ! I have to admit that you did mention some great tips to consider regarding importing products from China especially through Alibaba. Excellent article. I’m just starting to research importing from China. This article gives me the right framework and direction for pursuing how to proceed. Thanks for sharing. China is a great place to buy innovative products and sell in our region. Thank you for the post.